I’ve been impatiently waiting for the Guerlain Un Soir à L’Opéra (A Night at the Opera) Christmas make-up collection to drop since I previewed it a little earlier this year. It’s a sublime collection from the purveyors of absolute make-up luxury, offering its signature combination of no-holds-barred opulence with a slick, modern twist. I mean, just look at that gorgeous promotional picture above; you’ve got to appreciate the off-beat glamour of Natalia Vodianova at the opera resplendent in a red lip every bit as dramatic as her surroundings. Following the intertwined fragrance and make-up narrative of 2013’s neon-tastic ode to La Petite Robe Noire (Crazy Paris); 2013’s Oriental-inspired glamour (Liu), and 2012’s art deco Vol de Nuit beauty (Belle de Nuit), Un Soir à L’Opéra pays homage to the golden splendour of Coque d’Or, a fragrance created by Jacques Guerlain in 1937. Crafted for his friend Sergei Diaghilev, founder of Les Ballets Russes, Coque d’Or celebrates the enchantment of a night at the Bolshoi. This inspiration is felt in every item in the collection, with chic golden facets as far as the eye can see and plenty of collector’s pieces. 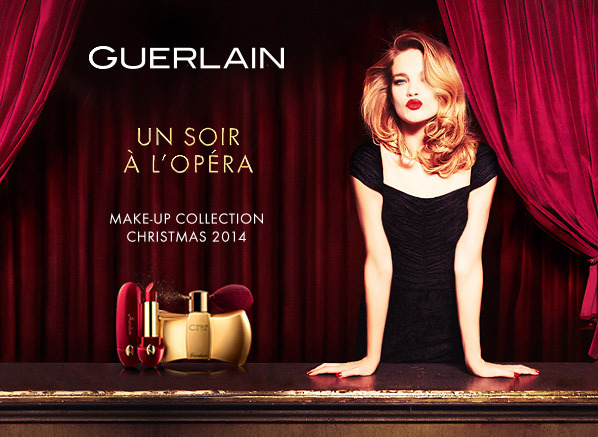 So, without further ado, it’s time to well and truly step into Christmas, Guerlain-style. Let’s start our exploration of the collection with a showstopper. 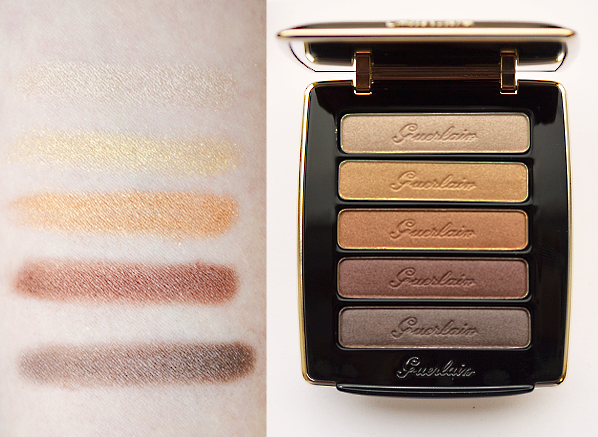 The Guerlain Petrouchka Eye & Blush Palette performs quite the feat; it’s undoubtedly beautiful, but it’s also functional, offering five neutral eyeshadows and four (yes, FOUR!) blushes in a compact that’s optimised for portability. The palette is surprisingly light and tactile despite its heavyweight look, and the size is pretty perfect. Inspired by the bow of a ballerina’s shoe, the elasticated bow around the compact also doubles up as a bracelet or hair tie. 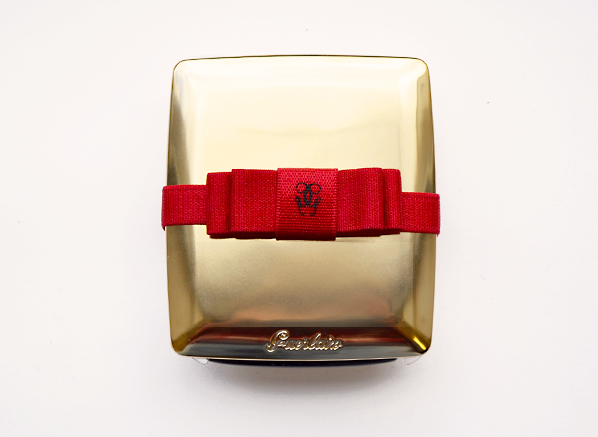 The contents are as luxurious as you’d expect from Guerlain. The two-tiered compact allows for more product, with generous sizes of eyeshadow in the first tier, and the four blushes at the bottom. Each shadow has a satin-pearl finish and are ideal for a festive smoky eye, with shades including champagne, goldenrod, copper, bronze and brown. 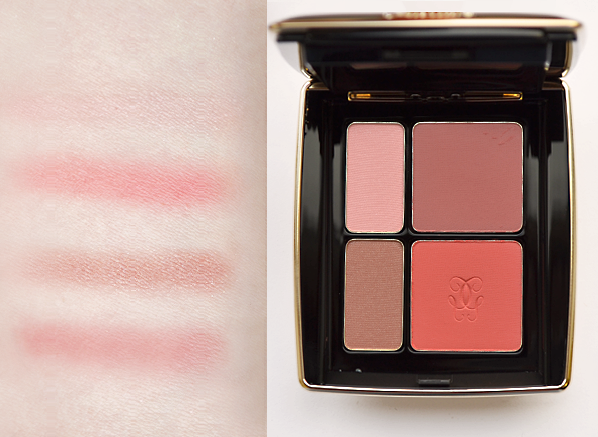 The two larger blushes are lovely and matte in shades of rosewood and coral. The two smaller shades have a more pearlescent finish, brightening cheeks with fresh pink and taupe. The other star product in the collection is the Coque d’Or Perfumed Shimmer Powder, an ultra-fine body powder shot through with subtle glimmer and scented with the grand floral fragrance of Coque d’Or. To me, this product represents the absolute best of Christmas beauty; it’s extravagant, luxurious and ritualistic, and looks as though it would be completely at home in the boudoir of a silver screen icon. 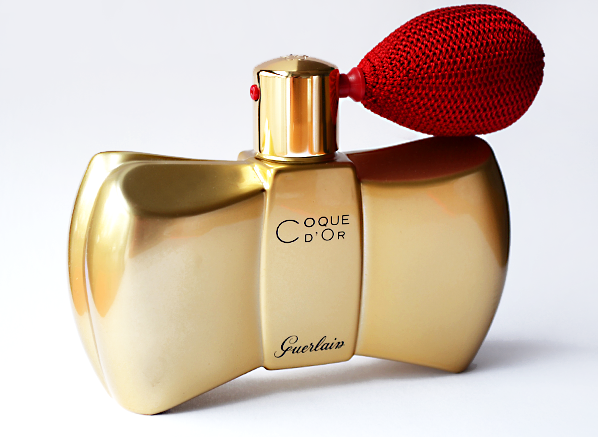 The bottle is an homage to the original bow-shaped Baccarat Coque d’Or perfume bottle, and is finished with an arresting crimson puffer atomiser. Simply squeeze to release a gentle puff of glittering, scented beauty. Rouge G collectors will love this season’s limited edition look. Guerlain Rouge G in 920 Rouge Parade not only introduces a brand new, sumptuous shade of red lipstick, but also features matching red lacquered packaging. Finished with a gold accent embossed with the emblematic Guerlain ‘G’, this heavyweight lipstick is a beautiful little treat. 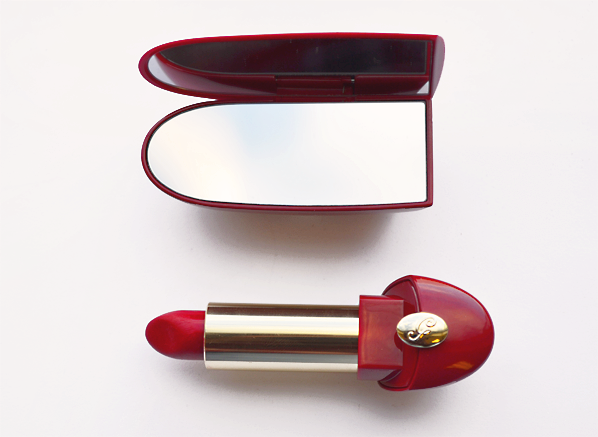 Open it up to reveal the signature flip-up mirror and a gold barrel, which contains the ultra-creamy, opaque lip colour in a shade of red the colour of plush velvet curtains. A must-have. If a glossy lip is your idea of a perfect Christmas lip look, then prepare yourself, as these two new offerings are pretty special. 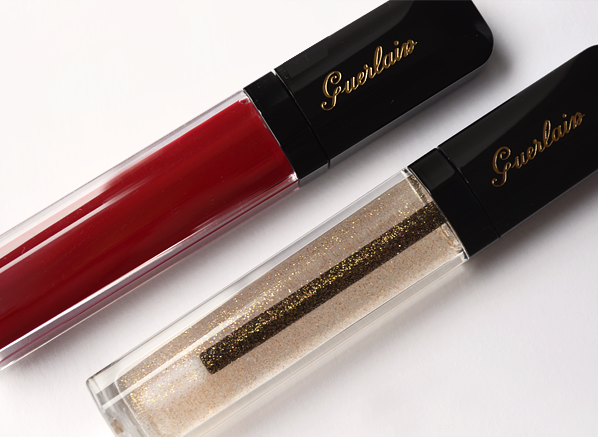 Guerlain Gloss d’Enfer in 901 L’Oiseau de Feu and 920 Rouge Parade are contrasting colours that offer something for everyone. Those who favour rich pigmentation will love Rouge Parade, a deep cherry red that offers a punch of almost-opaque colour in a single swipe. I’ve been dotting it onto my lips and blending it out, as the absence of wax in the formula means it can be sheered out easily and worn like a tinted balm. 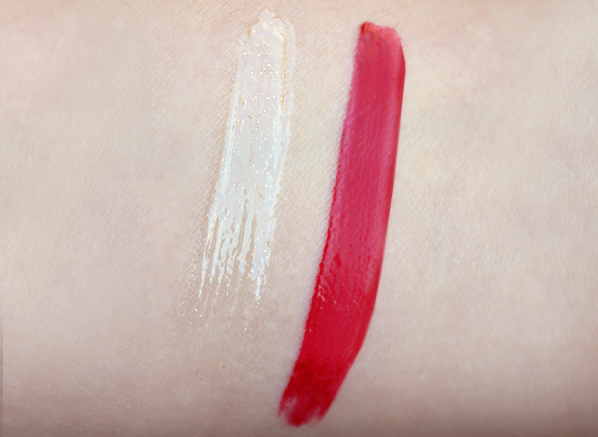 901 L’Oiseau de Feu is more understated despite its high shimmer content; the base is transparent, and the shimmer is actually micro-fine, so you just get the hint of a glow. Wear it over your favourite lipstick for a festive twist on your everyday lip. And for nails, a masterclass in Christmas festivity. 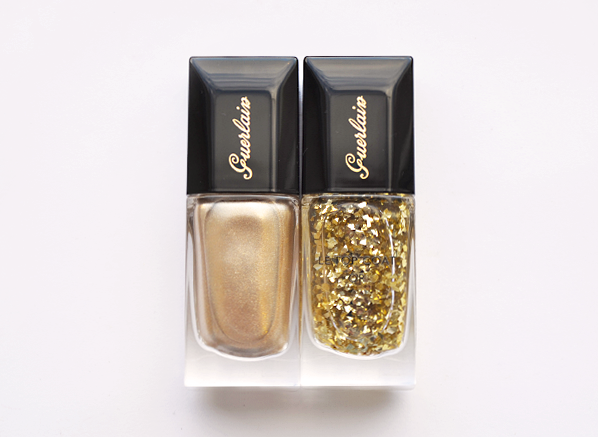 La Laque Couleur in 400 Coque d’Or is very true to its ‘golden shell’ name, a shade of molten champagne gold littered with microfine shimmer, which gives a delicate metallic effect to the nails without being too shimmery. 901 L’Oiseau de Feu, on the other hand, is glamour to the max! This top coat has fragments of gold leaf suspended in a clear base for a seriously opulent result. Wear alone or on top of another colour for added impact (tip: it looks especially good when worn over Guerlain’s L’Heure Blue, a vampy blackened red). 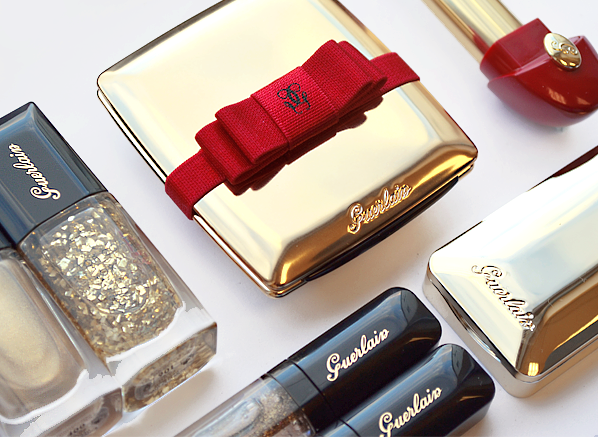 What do you think of Guerlain’s thoroughly decadent take on Christmas? This entry was posted on Tuesday, November 11th, 2014 at 10:07 am and is filed under Christmas, Christmas Gifts, Make-up, Swatches, Tried & Tested. You can follow any responses to this entry through the RSS 2.0 feed. You can skip to the end and leave a response. Pinging is currently not allowed. WOW, just wow. What a collection!